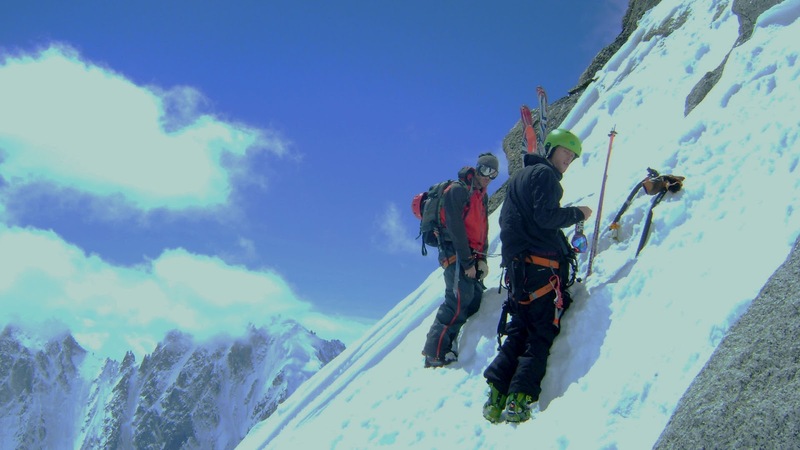 After our day in the in the basin we weren't sure what to get on, as the Grandes Montets closes next week, we were really keen to do something off there. We really wanted to get on the NE Slope of the Courtes, but we knew that it wouldn't have majorly transforemed overnight. 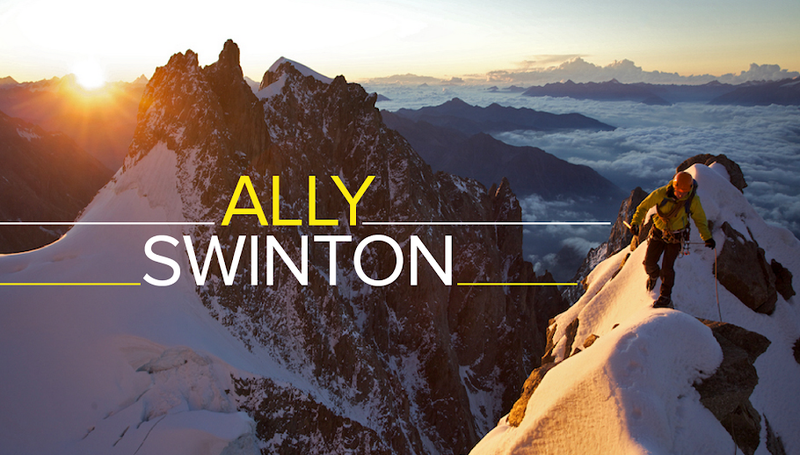 So graham came up with the idea about doing the West face of the Aiguille du Chardonnet, which grabbed all of our attention. Though some of us only have the attention span of a salmon! Still it was grabbed. Me, Graham and Bouche made sure we were on first bin to give us as much time for getting up and down before the afternoon storm came in. I think it was quite cold overnight with a slight sprinkle of snow which made the tracked snow from the day before interesting to ski on. 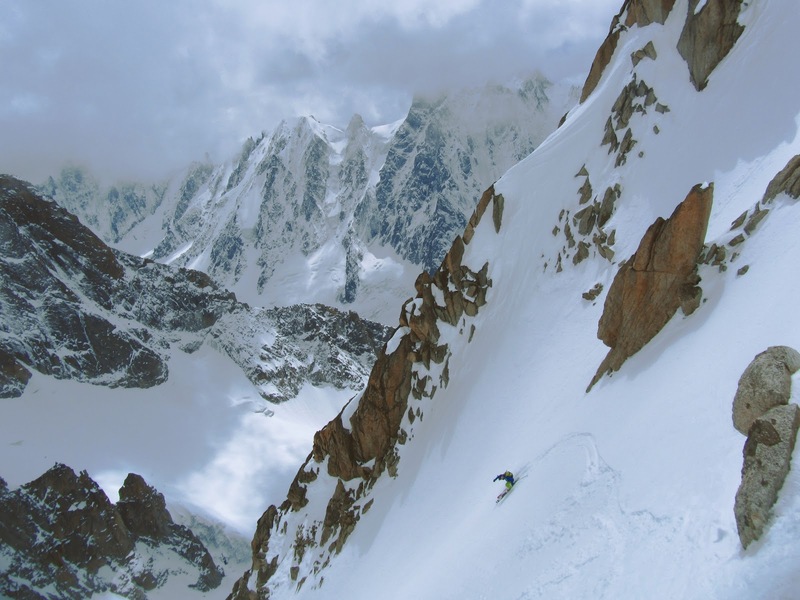 From the Argentire basin we skinned up to the Col du Chardonnet from where you gain the South East couloir of the Chardonnet. The skin up from the basin was well hard packed frozen snow as it's in the shade first thing in the morning. We had to take our skis off near the start even though we had ski crampons. So I would definitely recommend taking them for this area. 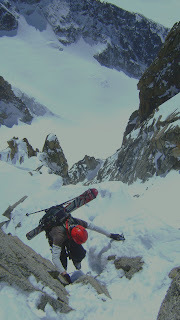 We reached the bottom of the SE couloir at the back of 11. (just after 11, still don't understand how no one understands this!) Just as we were taking our skis of and getting ready to start climbing, two skiers came down the couloir. 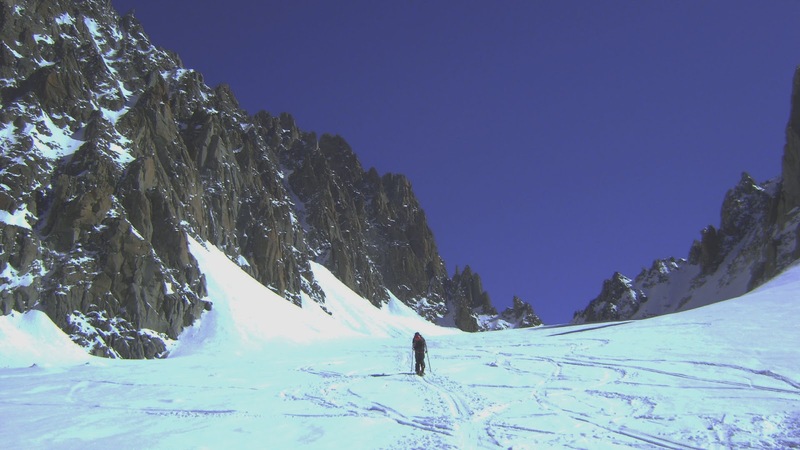 They had stayed at the Argentire hut and left early so they could ski the couloir in good snow before it got too heavy from the sun. 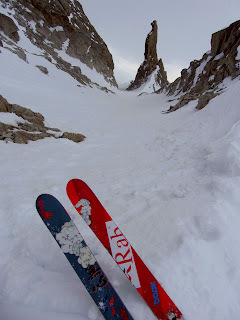 I had really fancied doing the SE couloir for a while after I toured past it a few months ago. It's about 500m long and has a few sections of 50° but mostly it's 45°. I started climbing up the couloir thinking this was going to a nightmare of trying to swim uphill, but because there had only been two skiers down the line I managed to use their boot pack tracks. Graham was battling a severe case of hangoverness, so I took the lead for most of the way, and Bouche told me that he is really good at 'bringing up the rear'! It took us about 2hrs to climb to the top of the couloir, but as we were near the top the clouds starting creeping into the basin and managing to cover the sun which started to make things quite cold. We noticed that the snow was starting to firm up in the couloir which faces South! Graham was concerned, or his hangover was getting the better of him, that the snow on the West face might not be great as the cloud will come over and cools everything down. Which I'm sure he was right about, as when we geared up to ski down the SE couloir the cloud came in and made temperature quite nippy. So from now on Graham is making all my life desicions! Snow was starting to get heavy by this point, which wasn't making it easy on our tired wee legs. Our plan was to climb up the SE couloir and ski the West face, but we had to change plans and as we had just climbed the couloir we knew we had the SE as a backup option, and what a great backup. The snow was really heavy in places but still really enjoyable with plenty of fresh to be had. One thing I love about skiing in the mountains is some of the exits you get from the mountains. A massive big run out where you can just let it rip is a great finish after skiing some steepish terrain. We stopped at some rocks for a wee spot of lunch which were yogurts that Bouche brought, I had no spoon so came up with the brilliant idea of using my ice screw as a straw! Bouche enjoying his brown pudding! The ski back down into the basin was really good.The snow was heavy, which just meant you had to go fast! thanks, yeah it's great when there's a few people skiing as you get good shots. Climbing wasn't as interesting as the skiing though!